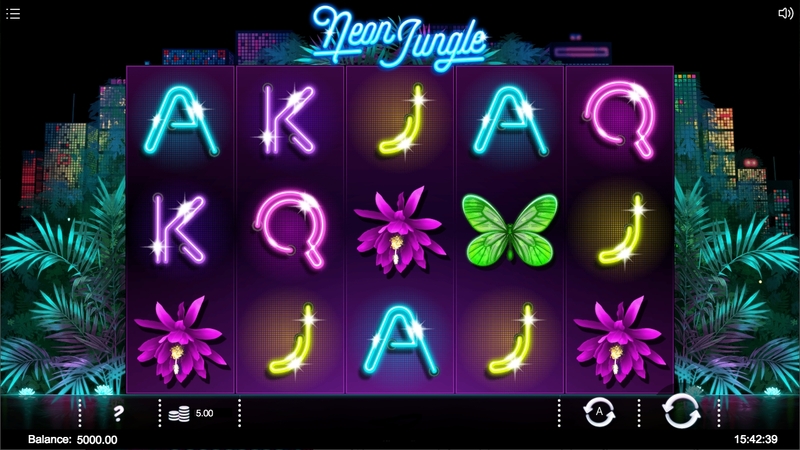 Neon Jungle slot combines the very natural world or the jungle with the very man-made experience of neon lights. Not typically two things you might naturally put together, but credit to Iron Dog Studio, the result is quite appealing on the eye. There is a light, continuous soundtrack to Neon Jungle, as is common with other Iron Dog slots like Gifts of Ostara and Rainbow Wilds. So will these brightly coloured animals reap us rich rewards or will they remained locked well within the undergrowth of the jungle? This is a standard 5 reel slot, with 3 rows and 20 paylines. The top paying picture symbol is the tiger, rewarding 100x for a 5-of-a-kind (5OAK) - pretty impressive! Lower paying symbols include parrots, frogs, butterfly, exotic flower and then the card symbols A-K-Q-J. The monkey Wild symbol substitutes for all symbols except the Free Spins, Scatter and Bonus. Bonus - Get a glowing bonus symbol and you will trigger a special keno game, the more numbers you match the better your rewards. 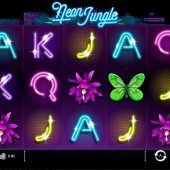 Neon Jungle is a fun and enjoyable slot, but lacks some of the pizazz you get with some other Iron Dog slots like Blood Queen or Cherry Blast. A typical 96.13% RTP is what you can expect from the medium volatility slot. I personally would have preferred one very exciting feature, rather than the 4 different features you get, but some of them can deliver decent wins when they feel like it. If you enjoy this sort of theme then you might want to try The Wildife from IGT or Jungle Wild from WMS - both are quite enjoyable to play.